237 pages | 5 B/W Illus. Negotiation is the most important skill anyone in the business world can have today, because people must continually negotiate their jobs, responsibilities, and opportunities. Yet very few people know strategies for maximizing their outcomes in everyday and in more formal business situations. This volume provides a comprehensive overview of this emerging topic through original contributions from leaders in social psychology and negotiation research. All topics covered are core to the understanding of the negotiation process and include: decision-making and judgment, emotion and negotiation, motivation, and game theory. 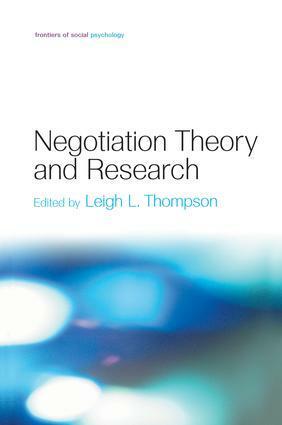 Chapter 1: Negotiation: Overview of Theory and Research. Leigh Thompson. Chapter 2: Bounded Awareness: Focusing Failures in Negotiation.